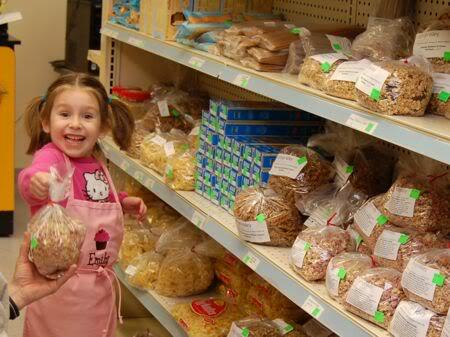 I took Emily with me for a fun day of volunteering at our local food co-op! The co-op features lots of fabulous local, organic food: cereals, pastas, meats, cheeses, eggs, milk, etc. She was very excited to be able to help out. We both put on our aprons and got to work — we were kept very busy! There was lots of measuring, labeling, putting price tags on items…. At the end of the day, Emily exclaimed, “What a fun day!”. I think she will be sleeping well tonight. How about getting Emily to sweep OUR floors? Honestly! Looks like shes having a blast! That is a great experience. Looks like she had a great time. So cute, looks like she REALLY liked it. Sweet dreams…. Mark's comment made me giggle. 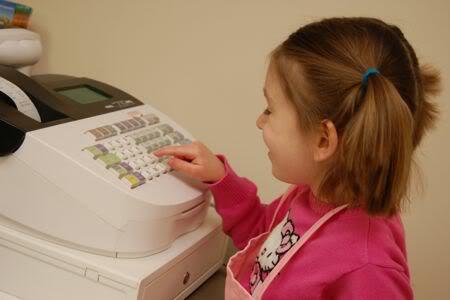 Emily is quite a little helper, and I just love the picture when she is helping the customers. Hi, ur blog is really nice and interesting, I have bookmark it & anxiously waiting for ur new post. I just wanna suggest that u should go for blog advertising & marketing there is a website called Blogerzoom.com which is offering very unique features at affordable prices. There are Expert advertising teams in Blogerzoom who will promote ur blog & affiliate ads through all over the networks. All u have to do is submit your blog plus pay affordable prices and rest leave it to Blogerzoom advertising team for Advertising & Marketing then see how u enjoy a lots of quality traffic plus good readers to ur blog. What a fun and wonderful learning experience. I'm looking forward to the kids being slightly older and being ready to volunteer. She seems so sweet and easy going… do the pictures represent how she is all the time? I like so much to see you guys doing stuff like that. It's wonderful how she's learning to care for others, save money, creating and being artistic. So fabulous. 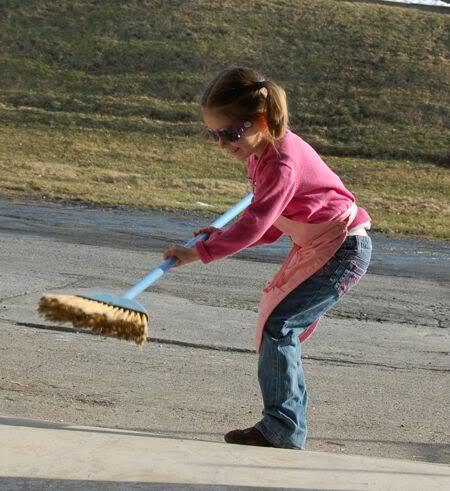 She looks like a very enthusiastic helper! Oh, so fun!!! What a great experience! @ Petula — That is exactly what I love about bringing Emily with me for volunteer work! I think she is learning such valuable life-lessons, and it keeps her quite busy too. Plus, it's great for the community! It's a win-win!